Back in Sao Paulo for the second to last race of the season. Last year Kimi qualified an impressive 5th in a car that had no development in it whatsoever for several months. He got a great start and would have taken 2nd place in the start if not for Mark Webber who made his signature chopping move and took out Kimis front wing. He had to limp back to the pits and the back of the field with a puncture – which in all fairness, Webber had nothing to do with. In the pits he was set on fire, got race fuel in his eyes which burned there for the next 1 and a half hour. Still he managed to finish in 6th position. Legend. As we know, Button went on to secure his championship in that race. This year, the drama was all about the point standings. Saturday saw a crazy topsy-turvey qualifying session. The track was very wet but drying and there was no room for error for any of the main contenders. Hamilton still had a shot of the championship but he would have to win the race. The Red Bulls showed great speed under these difficult conditions. And Fernando Alonso was as usual trailing closely behind them. Schumacher seemed to thrive under these conditions far better than his teammate. Which should be no surprise if you have seen him race in the rain before. He has a great feel for the car which not many other current drivers posess. It is for instance not a strong suit for Alonso who only just won his first wet race in Korea thanks to Webber and Vettels retirements. Anyway, the Red baron who is now the Silver baron outqualified Rosberg which has not been the norm this year. I am repeating myself, but its going to be interesting to follow this teammate battle in 2011 if Schumacher gets a car that would supposedly suit him better. Up at the front there is a huge shakeup. Its not a Red Bull on pole – its a Williams! And its not even the veteran Barrichello, its the rookie Hulkenberg! You could say he timed his final lap perfectly by crossing the line with only seconds to go. And with a drying track this is crucial. And he clocked a time which was 1 second faster than the Red Bull of Vettel. And 1,8 seconds faster than his own teammate, which is an eternity in Formula 1. But get this: His second to last lap was also good enough to secure pole position! The Hulk has definitely proved his worth in F1. Not to toot my own horn but this is exactly why I cheered for him in GP2. I always knew the boy was special. Lol. It was Williams first pole since 2005, by the way. 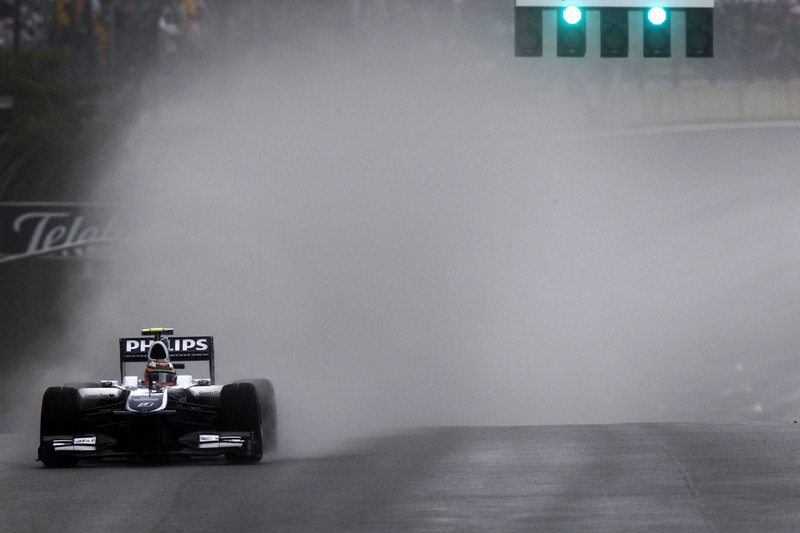 After the Hulk and the Red Bulls, Hamilton also showed off his wet weather skills and secured 4th place on the grid. Behind him was Alonso, 1,5 seconds slower than the pole lap of Hulkenberg. 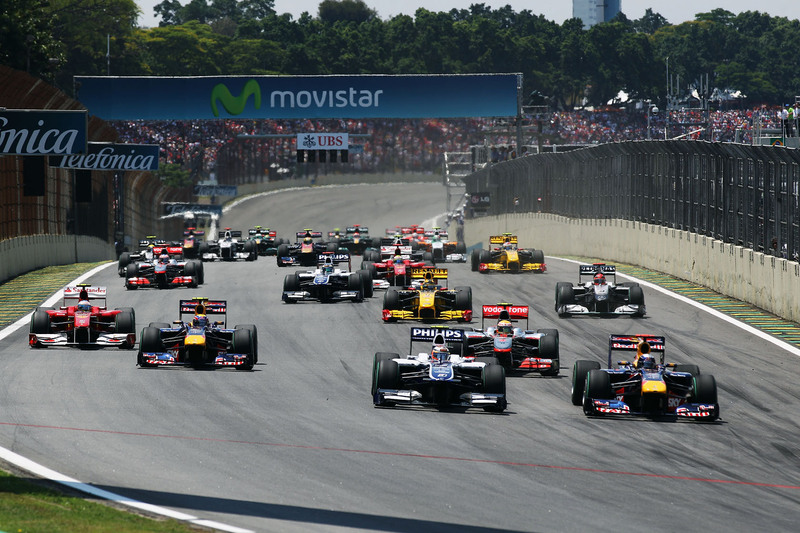 Massa was down in 9th and any hope of him helping Alonsos title fight in Brazil were all but gone. Race Sunday and there is a completely dry race ahead of us. Lights out and we are racing in Brazil! The Hulk gets a tad of wheelspin and Vettel gets a good start this time and goes first into turn 1. Hamilton jumped Webber but lost the place again right away. Alonso was able to pass Hamilton on lap 2 and the Brit seemed to struggle for grip which he was quick to announce frequently over the team radio. Now that we had a dry race, the nature of F1 is such that the ability of the car matters more then and driver ability less than it would in wet conditions. A wet race truly brings out the big talents from the crowd. 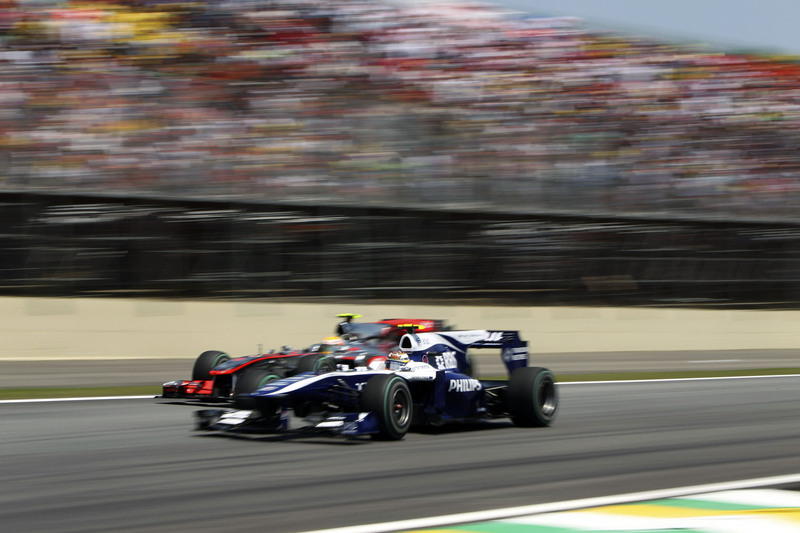 As the race progressed the shortcomings of the Williams were very apparent when racing amongst Red Bulls and Ferraris. Hulkenberg did his very best to keep his competitors behind, but his lack of grip out of the corners really hurt him and he was eventually passed by Alonso and Hamilton. Button decided to pit early for the hards. A move that would prove to be a stroke of genius. He started 11th and would finish 5th just a second behind his teammate. Jenson surely has a flair for race strategy. His 2 wins this year is down to clever decisions like this. After this the race settled into its natural pace. Vettel was well out in front, maintaining a gap of around 3 seconds to his teammate. In 3rd behind the bulls was Alonso, trailing them with a 10-15 second gap. The big question now was if Vettel was going to let Webber by for the championship. If he did, then a win for Webber in Abu Dhabi would be enough to win the championship. 2nd place would mean he would be 8 points behind Alonso with Alonso finishing 3rd. And to win then, he would need a victory with a car between him and Alonso. This incident brought out the safety car which bunched up the field. Neither Vettel or Webber would be pressured at the restart since they would have a couple of backmarkers in between them as a buffer. In that regard I think the old rule with having the slower cars unlap themselves so that the order of the cars at the restart would be according to race position was better and more exciting. Still, it brought forth some good scraps midfield and added some needed drama to the race. Rosberg had a horrid pitstop where his crew didnt seem to know what tires they should fit him with. So he went in again but still retained his position since Schumacher was nice enough to let him by due to the fact that he had fresh rubber on. Nico finished a very strong 6th place all things considered. 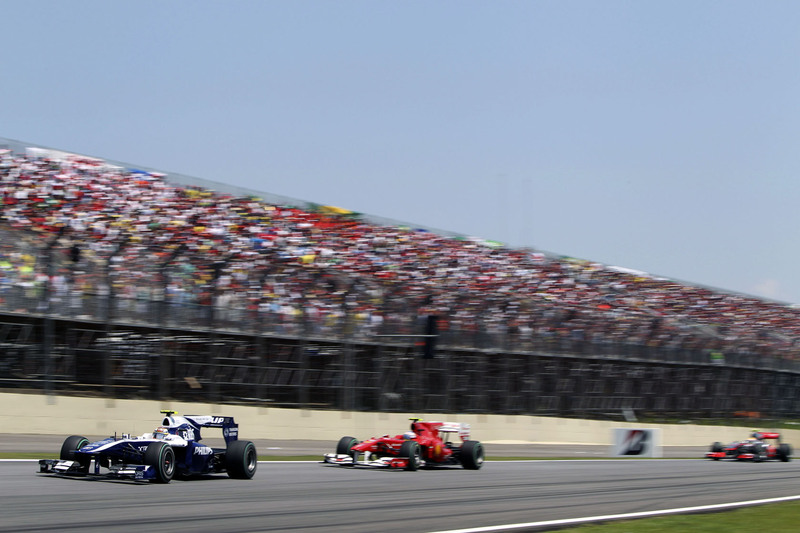 During the final laps Vettel pulled away slightly and Alonso seemed to push hard to close the gap to Webber. It turned out that Webber had to shortshift due to his engine temperature getting a bit high. With a few laps to go he got the all clear from the team to push if needed. Could it perhaps have been a ploy from the Red Bull team to give Fernando a whiff of a gained position to make him stress his engine more? Probably not, but its a fun thought. Nevertheless, Vettel crossed the line to win the Brazillian GP in a rather undramatic manner. Payback for Korea and last years GP where Webber climbed onto the top step. 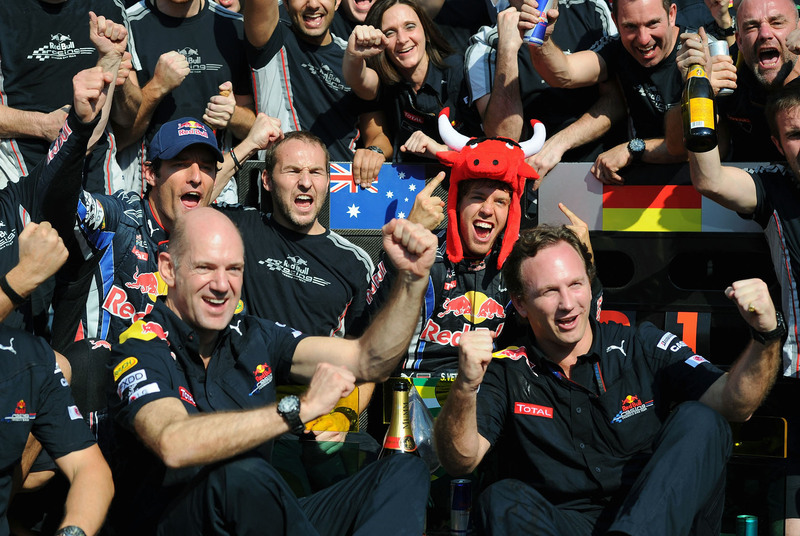 The 1-2 finish for Red Bull sealed the constructors championship for them. And that is well deserved if you ask me. Even with all the technical failures its a very very impressive bit of kit. Even when the FIA tried to kill of their flexi wings, they passed the tests and are still the by and by fastest car. And because of this, either of their drivers may still win the drivers title if they play their cards right. Its going to be the most anticipated final race in years. 1 year ago we saw a star being born right before our eyes. 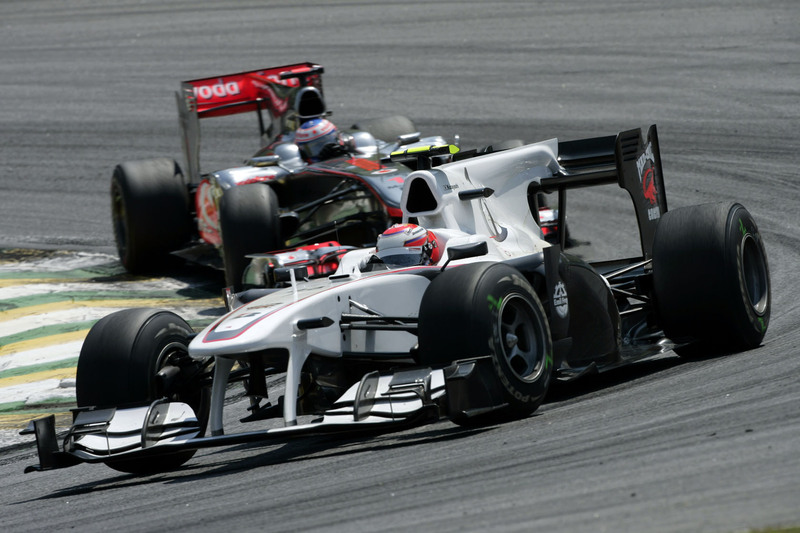 Kamui Kobayashi took the wheel of the Toyota in the absence of Timo Glock who had injured himself at Suzuka. And what a race he had. It did not look like someones first race in an F1 car – which it was. It was a seasoned drive of someone both mature and with a fighting spirit still very much alive. He had such a great battle with Jenson who finally did manage to pass him. He qualified 11 last year and finished 9th just outside the points. This year, his Sauber was not nearly as competitive as the Toyota was last year. If you remember, it was on pole in Bahrain. Still he qualified 12th well ahead his seasoned teammate, Nick Heidfeld. And after some great scraps with Alguersuari and Buemi after the restart and a fight to the finish with Kubica he had clawed his way up to 10th, just inside the points. I can easily spot a driver seat in both Ferrari and McLaren that would fare much better in the hands of young Kamui. But alas, he is still in the Sauber for 2011. I really hope it will be a better and more reliable car next year. Sebastian Vettel for keeping his cool at the start and taking the lead. From then on he controlled his pace and was never pressured at any point. Even if it may not be the smart thing to do, I also give props to the Red Bull team for letting their boys race instead of going all strategic. Im sure they prefer Vettel winning the WDC. And he will if he wins in Abu Dhabi and Alonso has a bad race and finishes 5th or below. Stranger things have happened. But there is no doubt that Webber will inherit the win if needed. There is no way they will let a rival take the championship if they can avoid it. Not too many of those today. Only one that really springs to mind is Liuzzi with his unprovoked crash. The Hulk starting on pole and the exciting first few laps. The midfield scraps brought forth from the Safety Car period. The points battle of the front runners making it go down to the wire in Abu Dhabi. Take care race fans. Next weekend is going to be real busy for me. Last F1 race and the last rally of the season for Kimi. Phew..
Congratulation to RBR. Really the fastest car won the deserve championship. Now i wish to see the deserve driver to win the title. The driver title shouldn’t belong to someone who simply has “luck” Praying hard for Renault engine …. please behave ok?